On June 1, 1926, George A. Coulter completed one of the first four irrigation wells in Cheyenne County, among the earliest in western Nebraska, on his farm just south of here. He and his son, James, dug the first twenty-two feet by hand. Charles Stanton, a Potter, Nebraska, driller, completed the final sixty feet to reach the Ogallala aquifer. The well pumped about one thousand gallons per minute, irrigating one hundred acres of corn, alfalfa, and wheat. Coulter sold the farm to Albert Nielsen in 1929; the well was still in use by Nielsen's sons in 2009. Irrigation from streams began in western Nebraska during the latter years of the nineteenth century. In the 1940s and 1950s the drilling of groundwater wells expanded rapidly, extending irrigation's benefits throughout the state. By the end of the twentieth century the self-propelled center pivot system, developed in Nebraska, had become a common method of irrigating crops. Irrigation helped transform the state into one of the nation's leading agricultural producers. In 2009 Cheyenne County had 631 registered irrigation wells, with more than 105,000 registered in Nebraska. 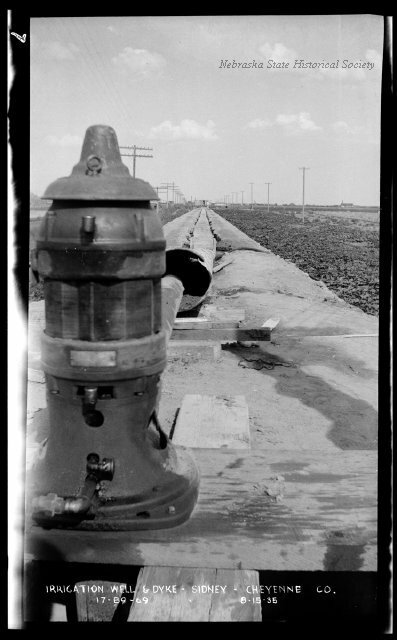 “Early Irrigation in Cheyenne County,” Explore Nebraska History, accessed April 18, 2019, https://mynehistory.com/items/show/69.